Not really stern, more disappointed, but it was too obvious a pun to ignore. I've had a quick look at the climate science bit (the full report is here), and I don't much like what I've seen. He briefly cites our work only to ignore it - I certainly don't blame him personally for this, he can only use what climate scientists tell him and there's no doubt that our work is far from the "consensus" of the peer-reviewed publications in this area. However, it is also evident that the "consensus" is seriously flawed on this point, and it is disappointing that no-one else seems prepared to admit it or even discuss the matter in public. From my brief glance, it seems like he uses two climate sensitivity distributions, one based on the 1.5-4.5C of Wigley and Raper (drawing on the IPCC TAR) and another higher range based on Murphy et al 2004. While he doesn't go as far as to use some of the rather silly pdfs that have been presented, he's clearly been strongly influenced by them, mentioning a 20% chance of climate sensitivity exceeding 5C a few times. Of course most of the exciting numbers being quoted from his report are those arising from the highest end of the higher range that he uses. I've said before and I'll say it again, it seems quite a hostage to fortune to base policy decisions entirely on stuff that we are all pretty confident will not happen (but merely disagree on the definition of "pretty confident"). Our work has been published for a full 6 months, and a fair number of people working in the field first saw it over a year ago, so there has been plenty of time for some sort of response (I don't necessarily mean a direct comment on it, but rather new publications which take account of the arguments we have presented here and again here). So far, we've only managed to screw out some rather limited comments from Allen and Frame, and that only through the tactic of singling them out for direct criticism. Nevertheless, they have admitted (or perhaps I should say boasted, since they seem to consider it a feature not a bug) that they do not believe the results that they themselves have generated - and note further that this admission is not merely made with reference to the particular GRL paper in question, but is a general comment on the methods they and others have widely used. One IPCC AR4 author has also admitted privately via email that he is "pretty confident that the sensitivity range is 2 to 4 K or smaller" but he's never published anything like that. Come on guys (and girls), it's time to come clean before this mess gets any worse. Just because it's in the forthcoming AR4 doesn't mean you have to defend the "consensus" to the death. At the workshop I attended this summer, someone made the (at the time) amusing comment to the effect that it would be scary what was going on in probabilistic climate prediction, were it not for the fact that it was being ignored by the politicians anyway. Well, it's no longer being ignored. 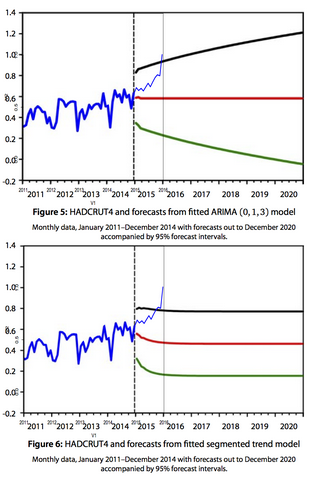 On top of the high climate sensitivity range, Stern uses the rather extreme A2 scenario (and essentially describes it as "business as usual") for his projections, even though it is already clear even 5 years on that we are falling behind this emissions pathway. I really think it's time the economists got their act together on this. And then he adds some feedbacks on top, based on results like those of the Hadley Centre model which has an extreme Amazon dieback due to having way too little rainfall in this region even before any global warming is considered. If the Japanese model had this behaviour everyone would just say it's a crap model but because it is HADCM3 it is supposed to be alarming :-) I see RP also has some criticism of the hurricane stuff. FWIW, I don't support him 100% on his general approach (too much "its not proven" and not enough "what is a realistic estimate") but I think he's more right than wrong. Anyway, my main beef is with the probabilistic estimation, because that's what I understand best. It seems crystal clear that the methods are intrinsically faulty - indeed the errors seem rather elementary once they are stated clearly - and it is long past the time that people should have been prepared to accept this and talk about it openly. Nature's comment that our criticisms "apply more generally to a widespread methodological approach" is hardly a valid defence of the science! Stern's results appear to be heavily dependent on the small probability of extremely bad consequences, so these problems may substantially weaken the value of his report. OTOH, it might be the case that even with a climate sensitivity of 2.5C and assuming a more moderate "business as usual" emissions growth, mitigation is still amply justified (personally I think action is justifiable on a number of grounds irrespective of the supposed "climate catastrophe"). After 5 years here doing our best to blend in with the locals :-) our innate British nature is coming to the fore and we've been spending some time house-hunting. I can't help but think it's a bit crazy to consider buying, as we have no job security and currently live almost rent-free in a very nice house in a beautiful neighbourhood (technically, our employer rents the house and sublets to us at a massive discount through a rather Byzantine scheme). On top of the job situation we don't even have the right of permanent residency in Japan (nor any chance of getting this within the next 5 years, unless we take the drastic step of actually trying to take Japanese nationality). However, living in a rented house has its drawbacks, and it looks like we might well spend the next 5 years here - and that's not saying that we would necessarily wish to leave at that time, merely that we've never found it worthwhile looking any further ahead than that. Our current house has no fewer than 5 sets of single glazed French windows, no real heating, and a northerly aspect, which makes it rather chilly (as low as 3C indoors) all through the winter. Moreoever, although our landlady is very nice, the fussy rules (no pets, no decoration, not even a nail in the wall to hang a picture) are a bit wearing. In contrast to the UK, renting here is common and buying is relatively rare. In fact it seems like most Japanese basically live at home until they are about 35, perhaps renting a shoe-box to live in during the weeks if their job is far away from home. I think many of them pretty much wait to inherit rather than trying to buy by themselves - and the paternalistic behaviour of Japanese companies (many of which have subsidised rental schemes like ours) helps to discourage buying, as does the high price of property. Being rather eccentric cyclists (even by Japanese standards) we don't have quite the same requirements as most Japanese, which means there are actually some reasonable bargains to be had - being a 5 minute walk from the station is a drawback, not a selling point for us (been there, done that, suffered the sleepless nights from trains passing the window every 3 mins for 20 hours of the day). That's the sound of me coming back down to earth after taking another JLPT 2 kyuu practice test today. I only got a rather disappointing 54%, which is a full 12% down on last time and, more importantly, a fail. This time I used the 2nd test in this Unicom book and it is obvious that it is much harder than this other book of practice tests which I've also been using. However, there are still another 6 weeks which should be about enough time for another 6% improvement, even if this harder style is the more accurate guide to the real thing. To be honest I've been a bit lazy in recent weeks as I thought I was already quite comfortably up to the required level. This result may motivate me to start taking it more seriously again! There was one bright spot - over the last 3 weeks I've ploughed right through to the end of the grammar syllabus (using this book) and I passed that section, with a higher mark than any I've previously reached (even in the easier tests). I've still got a lot of reading practice to work through now and my teacher is threatening me with the 2004 paper as yet more exam practice. I've blogged about this it before, but here's another article asking for Daylight Saving Time (or in fact just changing the clocks permanently by an hour, year-round) in Japan. It's still light enough for getting up at about 6am this time of year, but getting gloomy around 5pm or so, which seems pointlessly profligate when people are supposed to be thinking seriously about energy efficiency. "one-sided and outrageous act beyond common sense"
One of my co-authors on the paper sent me exactly one email, that is to say that he should be included in the author list. And this was only in response to an email to which I attached a version of the paper which did not have his name on the author list. I don't know of any of the people directly involved (have never even met them, in fact). Guesses are welcome but I'll probably deny it anyway if you get it right! Actually it might be amusing to hear now common such behaviour is. Click the pic for more in a similar vein. Since blogger doesn't give the linked picture a blue border, here's another link. At the weekend, the fine weather which is characteristic of Japanese autumn finally broke out. Monday was a holiday, so after we'd got over our amazement at seeing the sun again, we had an overnight trip up Yatsugatake, justifiably one of Japan's most popular mountains. But this post isn't about our trip (which was excellent), but rather these poor people. I'm joining the dots here from various brief news reports so might not be 100% correct, but the events occurred on a mountain we've climbed twice now (once at this time of year, and again just a couple of months ago), so we know it fairly well. According to the various news reports, this group of 6 women mostly in their 60s (plus a leader significantly younger), were basically overwhelmed by the strong wind and snow on Saturday while aiming for one of the two huts near the summit of Shiroumadake, which is a big bleak ~3000m peak in the North Alps. 3 were benighted on the mountain and died: another succumbed even after being rescued and brought to a hut. I was one the verge of posting a rant about the incompetent leadership that put the walkers in this situation. But they were not complete novices (apparently they'd been on previous trips with the same guide), and have to take some responsibility for themselves. It's particularly sad that they must have walked straight past an energency shelter (just 4 walls and a roof, but they would have been out of the wind) and none of them were more than a few minutes walk from the huts when they were found. There are several points at which more prudent decision-making by anyone present would undoubtedly have saved several lives. When in any doubt about the conditions, I'm quick to turn back. A couple of times I've subsequently regretted the decision - but I reckon that's a whole lot better than pressing on and regretting that choice! Get a robot to do it for you! I'm not sure whether this is less useless, or more, than the one-legged hopping robot I mentioned earlier. But given a choice between a world which has been taken over by cute-but-useless Japanese robots, or American killing machines, I know which I'd prefer! I reckon this will soon be making headlines for all the wrong reasons. Since taking over a week or so ago, Japan's new Prime Minister seems to have spent alternate days building bridges with Japan's neighbours, and then knocking them down again. No sooner does he apologise for Japan's colonial rule and aggression (including his grandfather's role) than he comes out with the claim that World War II leaders tried by allies cannot be considered war criminals. Transport policy and politics has long been a side-interest of mine: as a keen cyclist, it's hard not to take an interest in these matters (at least while living in the UK where cycling is generally marginalised and actively discouraged: one more advantage of living in Japan is that cyclists are just normal people). I even have a publication related to the subject :-) It's long been clear that cycling has numerous benefits in terms of health and economics on top of the obvious environmental benefits (including - but not limited to - climate change). Over the past few months, I seem to have collected a number of blogable links on vaguely related issues which I will try to work though. Recently, this article about trains caught my eye. So UK trains are considered "overcrowded" if there are 35 standing passengers per 100 seats, and there are plans to increase capacity by taking out seats (people pack in better when standing). Shock, horror, "passenger groups" are outraged. Well, wake up and smell the coffee. Many (most?) Japanese commuter trains have bench-style seats along the walls, 20 to a carriage, with room for about 100 or more standing. Some carriages (the "cattle wagons" of the subject line) have no seats at all in rush hour - the bench seats are kept folded up against the walls. Even the supposedly all-seater shinkansen (5-across in a 3+2 airline stylee) are sometimes packed to 200% capacity (ie 100 standing per 100 seating) at busy times. can use their own :-) We hardly use the trains for commuting, although when it rains as much as it's done recently, we sometimes succumb to the temptation. At least they generally work over here, even if they aren't exactly luxurious. A Japanese business consultant [variously "psychiatric counsellor" and "clinical psychologist" elsewhere] from Chiba Prefecture has broken his own world record of reciting pi — the ratio of the circumference of a circle to its diameter — from memory by stretching it to 100,000 digits in a feat that lasted more than 16 hours through early Wednesday. By the time you’ve learnt 2-3000 kanji, each with multiple readings and meanings, and which combine with each other in pairs to give an order of magnitude expansion in complexity, a few digits of pi is small beer. Can you say “rote learning”? Stoat posits a "challenge to JA", based on a paper by Michel Crucifix (MC). There are some slightly subtle points which require a lengthy response to do them justice, so I'll post this here rather than as a comment. MC looks at a total of 4 models which were integrated under both LGM (Last Glacial Maximum, ~20,000 years before present) and 2xCO2 conditions, and finds little relationship between both sets of results. (He does, actually, find a very good relationship between the Antarctic cooling at the LGM and the global warming at 2xCO2 - but as he has just pointed out to me, it's an inverse relationship!) He argues on this basis that it is inappropriate to simply scale the global LGM temperature change by the ratio of 2xCO2/LGM forcings to get a value for climate sensitivity. To be honest, at first glance I thought that it was a bit of a straw-man argument, as surely no-one is seriously suggesting that one could do such a thing. However, James Hansen (eg here which refs to here) and some others have indeed presented pretty much this argument, so in that context MC's comments seem justified. In our GRL paper, we explicitly discussed the uncertainty in the LGM/2xCO2 relationship (which we had already shown to exist here) and attempted to account for this with a dollop of additional uncertainty on top of the simple forcing calculation. No doubt there is room for debate on the details of what we did, but we were hardly blazing a speculative trail here - Myles Allen has presented a vaguely similar analysis of the LGM on p42 of this presentation, for example, and there's a similar discussion on Ch29 of the "Avoiding dangerous climate change" book, as well as the cited Hansen work etc. If we analyse event X (and use it to update a so-called "objective" or "ignorant" uniform prior), we end up with a broad posterior pdf for sensitivity with wide bounds -> X does not provide a "useful" constraint -> we can ignore event X completely in any further calculations to estimate climate sensitivity. The fallacy is that between those two arrows, the term "useful" has changed its meaning from "providing a tight bound on its own in conjunction with a uniform prior" to "useful at all in conjunction with other data". This erroneous argument has been variously used for both the LGM state and short-term cooling after volcanic eruptions (and possibly elsewhere). But in order for event X to be truly useless, it would have to be the case that the likelihoods P(X|S=1C), P(X|S=3C), P(X|S=6C) and P(X|S=10C) (etc) are actually all equal, and no-one has actually made this (IMO) extraordinary claim! An unfortunate limitation of MC's work - not in any way his own fault - is that there were only 4 coupled models available with both LGM and 2xCO2 integrations at the time of his investigation, and they only covered a fairly narrow range of sensitivity, which gives little chance for a significant result to emerge (any correlation of less than 0.95 would not have been significant at the 5% threshold). I suspect that he would have found stronger results if he'd had a larger sample of models which encompassed a wider range of sensitivities (although I'm sure there would still have been uncertainty around any correlation). The Hadley Centre and/or climateprediction.net have been promising for some years now to do some ensembles of LGM simulations with their ensembles. Until they or others actually get round to it, we are pretty much twiddling our thumbs, but here is a more optimistic look at things, and there is also a recently-submitted manuscript on jules' work page. IMO the real debate is not on the binary yes/no question "Does the LGM constrain climate sensitivity? ", but rather "What evidence does the LGM provide relating to climate sensitivity (and more generally, other future climate changes), and how best can we use it?" If anyone wants to argue that the answer to this is "absolutely nothing whatsoever" then they are welcome to try, but I think they will find themselves well on the scientific fringes. Firstly, our recent manuscript, which revisits the question of an "ignorant" or "objective" prior, does not use the LGM at all (except inasmuch as it influenced the Charney report, which I guess is not very much). And secondly, I see that Myles Allen was quite happy to describe the work of several climate scientists as "wrong" in the presentation I linked to above. So those who accuse me of libel in my criticism of others could perhaps benefit from a sense of proportion. Cutting off your finger to spite your hand? There's a bizarre twist on an old proverb in the Japanese news today, with some right-wing nutter apparently sending a finger and a threatening letter to a Korean resident's group. 2 months to go (9 weeks today, in fact), and I'm up to 66.5% in my latest practice JLPT test. That's quite an improvement on last time, but I think I got a little bit luckier than usual in a few guesses this time. It still seems pretty tough - in fact of course a score like that means I "know" the answers to less than half the questions, but can make sensible guesses for many of them. For the reading comprehension part, I'm still horribly short of time, so my strategy is to basically skim through the texts and trying to narrow down the answers to the 2 or 3 reasonable ones. I wonder if it might be better to do part of it carefully and just completely guess the rest. In any case, I've got plenty of reading practice to do still, which should help speed me up. I've got past 750 kanji on the study list (and already know many of the remaining ones too) so feel to be on the home stretch as far as they are concerned. That's also got me to the position of recognising ~90% of kanji by frequency, so the reading matter all seems more familiar, even though my comprehension is still slow.